Liu Chien-hsu (Liu Jianxu) was a native of Hunan and a graduate of Paoting Military Academy who played a significant role in the anti-Communist operations of the late 1920s and early 1930s. 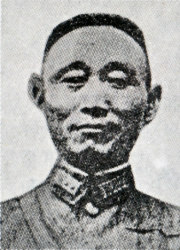 He commanded 10 Army Group at Hangchow during the Battle of Shanghai in late 1937. He was able neither to stop the Japanese landings northwest of Hangchow on 5 November 1937 or to hold Hangchow itself the next month. However, he continued to hold high military posts while serving as governor of Fukien province throughout the Pacific War. He defected to the victorious Communists in 1949.